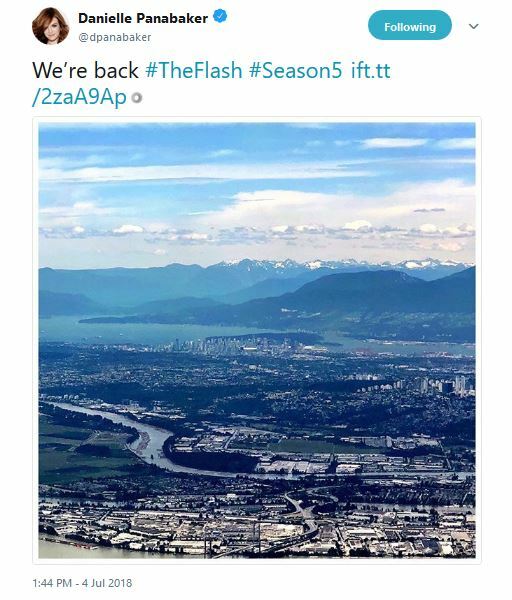 CW’s actress Danielle Panabaker share a sneak pic from the set of the Flash Season 5 telling official filming has started. Recently YVRShoots tweets that filming will take place in the heart of Vancouver’s Gastown and it will stats from Monday 16, 2018. Last season 4 of the Flash ends with an exciting way by introducing mysterious speedster as Barry and Iris’s daughter from the future. Calling herself Nora Allen, said that she had made one terrible mistake in the future and hence visited past for Barry’s help. Only three months remaining until the very premier episode of the Flash Season 5. But its first trailer most probably will hit the internet in this month at San Diego Comic Con. With the arrival of Barry and Iris’ speedster daughter, Nora Allen, who came from the future confessing to having made a “big mistake,” Will parenthood be the difficulty that finally slows The Flash down? Directed by Kevin Smith, The Flash Season 5 starts superstar Grant Gustin as Barry Allen/The Flash, Candice Patton as Iris West-Allen, Danielle Panabaker as Dr. Caitlin Snow, Carlos Valdes as Cisco Ramon/Vibe, Danielle Nicolet as District Attorney Cecille Horton, Hartley Sawyer as Ralph Dibny/Elongated Man, Jessica Parker Kennedy as Nora Allen, Tom Cavanagh as Harrison Wells, Jesse L. Martin as Detective Joe West. The Flash Season 5 will return on October 9, 2018, at 8:00 pm. 25 Most Powerful MCU Superheroes Ever In 2019, Ranked! © 2019 Hero's Facts. All rights reserved.